Hotel Chanakya is a budget hotel located centrally on Robertson Road and steps away from the Gandhi road police point and taxi stand. The Chowrasta Mall is five minutes walking distance from here and along the Nehru Road. 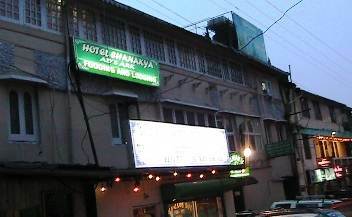 Chanakya Hotel is a leased property and run by a Bengali person named Bacchu Biswas who owns it on lease. The hotel caters mainly to the Bengali tourists looking for budget accommodations and serves Bengali food in an in-house restaurant. There is a row of cars that are parked right in front of the hotel and you will need to walk in between the cars to get to the main entrance of the hotel. The reception counter is right ahead as you walk in through the main door. There are 17 rooms in the hotel that are spread across the three floors including the ground floor. The present management is running the hotel for over three years. The rooms in the upper floors are superior and are costlier. Some of the upper floor rooms have great views of the mountain range and the valley. The view rooms have a small cushioned sofa and a table next to the window where you can relax and enjoy the views outside. Rooms have queen or twin beds, TV, cupboards and other basic amenities. The hotel has generator which is switched on after dark if there is a power failure which is often the case here. All rooms have attached bathrooms. There is a provision for hot and cold water in the bathrooms which is generally available during fixed hours in the morning or on request. Bathrooms are tiled and have a small mirror. One of the reasons this hotel is popular because of its in-house Chanakya Restaurant which serves popular Bengali meals. Bengalis who flock from Kolkata and Siliguri areas to this hill town, prefer a hotel that serves Bengali food which is one of their key vacation requirements. Other amenities includes laundry services, doctor on call, car rentals, travel & local sightseeing arrangements etc. The location is central and only minutes walk from the Mall although the location is a little congested. 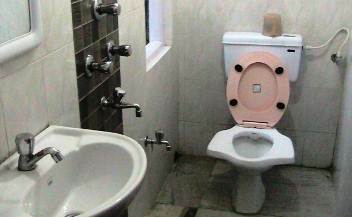 The hotel will suit budget minded Bengali tourists and visitors. It's a low cost hotel serving mainly Bengali food as well as other Indian dishes. The cook and most of the waiters here are Bengalis as well. Most of the great shops and restaurants are steps away from the hotel. However this is a leased property. And in a leased property the administration tries to minimize cost in all possible ways in order to recover the lease amount and make profits. This is reflected all over the hotel particularly in its maintenance and low cost furnishing. The management had run the hotel Seven Seas located few steps away, which had deteriorated over the years till the property owner decided not to renew the lease. Seven Seas has subsequently transformed and now run by the property owner himself. However, one positive point about Hotel Chanakya is that most of the waiters are loyal and some are even working for the management for nearly 15 years, and served several hotels. Hotel is often booked by tour operators accommodating large groups of low budget tourists. Chanakya Hotel is located on Robertson Road, yards away from Gandhi road police point and the Taxi Stand. It's located below the Nehru Road. 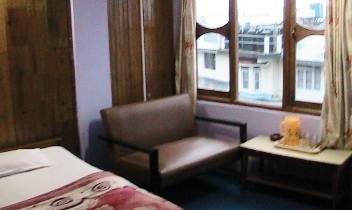 Hotel Chanakya, Robertson Road, Darjeeling 734101, India.